Since Activision owns the rights to the Crash Bandicoot franchise, many have lost hope that the PSone icon will be in PlayStation All-Stars Battle Royale. There is however, reason to believe that he still may be added to the roster, thanks to a recent tweet from Activision. 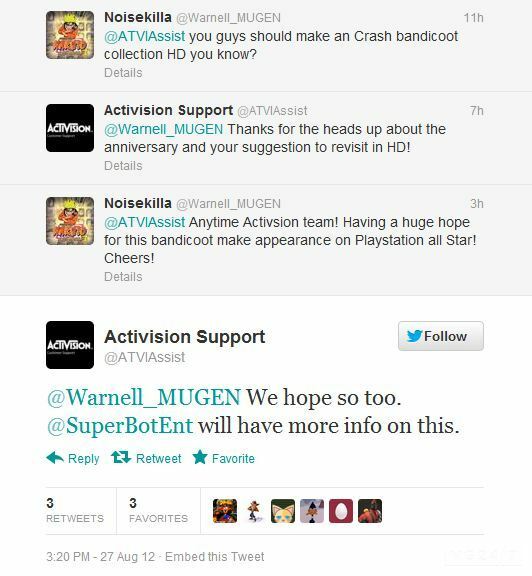 Sent in by a tipster claiming to be apart of 4Chan.org/v/, the conversation below between a Crash fan and Activision Support hints at the possibility of an upcoming reveal of the orange character. The Twitter conversation has since been deleted (go figure) which, if anything, adds veracity to the statements made by Activision Support. What do you think of Crash’s involvement in SuperBot’s upcoming brawler? Is he an essential addition to the game’s roster of fighters? In the event that he is a member of the cast, what do you think his three different super attacks should be? Let us know in the comments below. PlayStation All-Stars Battle Royale is set to launch on November 20th.